Citation Information: J Clin Invest. 2016;126(11):4140-4156. https://doi.org/10.1172/JCI87734. 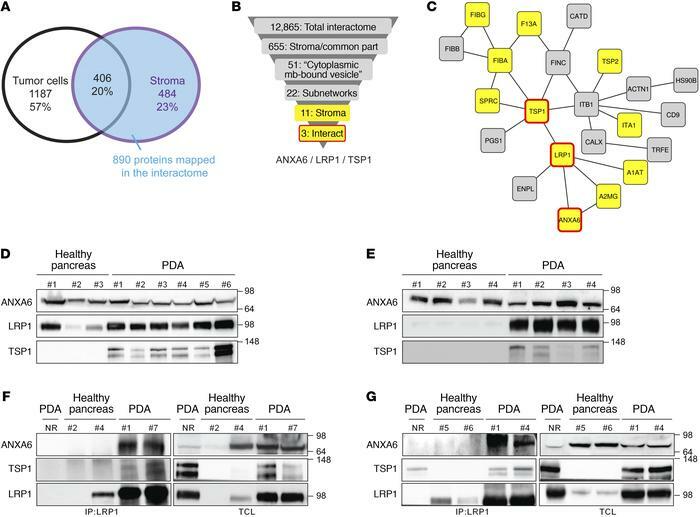 Human PDA microdissection followed by mass spectrometry coupled to bioinformatics analyses identifies a new complex in stroma PDA. (A) Number of proteins (and representative total percentage) obtained after mass spectrometry analysis of stroma and tumor cell areas microdissected from frozen human PDA slides (patients, n = 4; microdissected areas ranged from 30 to 50 mm2). (B) Graphical representation explaining how the complex comprising ANXA6, LRP1, and TSP1 was highlighted. (C) Twenty-two proteins belong to the same network of “cytoplasmic membrane-bound vesicles” obtained in Supplemental Figure 1D. Proteins in yellow boxes are specific to the stromal compartment, and proteins in yellow boxes surrounded by a red line are complex proteins obtained. (D) Western blot analysis of ANXA6, LRP1, and TSP1 in human healthy pancreas (#1–3) and PDA (#1–6). Amido black staining served as loading control. (E) Western blot analysis of ANXA6, LRP1, and TSP1 in murine healthy pancreas (#1–4) and PDA (#1–4). Amido black staining served as loading control. (F and G) Coimmunoprecipitation of LRP1 with ANXA6 and TSP1 in protein extracts from human (F) healthy pancreas (#2, #4) and PDA (#1, #7) and from murine (G) healthy pancreas (#5, #6) and PDA (#1, #4). Total cell lysate and nonrelevant antibody (NR) were used as loading and negative control, respectively. Data are representative of 3 independent experiments. Throughout the article, each “#” represents 1 PDA patient or mouse or 1 healthy donor or mouse.